Young adults/adults who are struggling with ambivalence; relationship problems and feeling blocked or stuck. Anxiety, depression and a sense of hopelessness. Send A Message To Arash. Do you feel frustrated? Stuck? Do you find fear or anger stops you from getting the things you want? I can help you overcome fear, anger & sadness by helping you find the roots of your current problems. If you're struggling with an emotional or relationship issue for a long while or if it's a recent event that's bringing you down, the therapy & counselling services I provide will help you get back on your feet and grow into your full potential & feeling better. If you would like more information (confidential voicemail), feel free to call me or visit my website. I look forward to working with you... to help you get the best out of you and your life! Life is meant to be lived well. 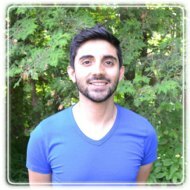 Arash Kameli is accredited by the Canadian Counselling & Psychotherapy Association, with a Masters Degree in Counselling & Spirituality from Saint Paul University and a Bachelors Degree in Psychology from the University of Ottawa. Arash has clinical experience with clients in an individual setting and also with couples, dealing with life problems such as depression, anxiety, loss & grieving, relationship issues, sexuality/sexual concerns, interpersonal skills, family issues, work-related issues, multi-cultural issues, gay & lesbian issues, trauma, coping, communication skills and issues related to spirituality.